So …you’re planning a trip to the Zoo and want to make sure it will go smoothly. Capron Park Zoo has a variety of services available for the convenience of our visitors. THE ZOO IS FULLY HANDICAPPED ACCESSIBLE! WAGON RENTALS FOR YOUR TIRED LITTLE ONES AVAILABLE! This fun and exciting zero-depth water playground is sure to thrill children of all ages. 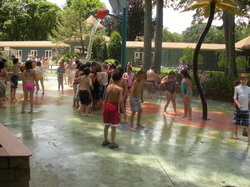 Be sure to bring a bathing suit and towel for the maximum fun factor! Fun Gifts For All Ages! Looking for a souvenir of your day? Find something special for yourself or someone else in the Zoo’s Gift Shop. 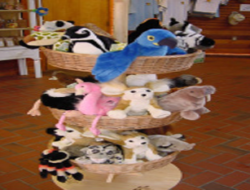 Lovable stuffed animals, games, mugs and much more are available for purchase. Open year round so you can even find a holiday gift for that animal lover in your life! Feed Your Hunger At The Concession Stand! 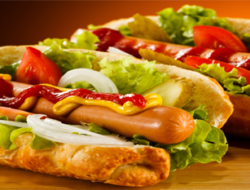 SORRY – the Concession Stand DOES NOT accept debit or credit cards – cash only! Although the zoo does not allow visitors to bring picnics into the zoo, the Concession Stand (open seasonally) offers delicious fresh cooked food that will satisfy the pickiest eaters. Enjoy an ice cream treat, a cold drink or even a whole meal while you rest at our shady picnic benches.